Do My Parents Need In Home Care Services? Let Your Daily Activities Decide. It’s often human nature to deny that we need assistance, although the truth is that often we really do. This is especially true for older adults, who may not wish to confess they need help doing the everyday things that used to be a snap but now are getting to be more complicated. For loved ones, this can make recognizing that an older adult requires help more difficult to identify. The encouraging news is that there are tools that can help family members better determine when a senior needs help. Regardless of whether you are planning long-term care for yourself or a loved one, there is a standard evaluation test called the Lawton Instrumental Activities of Daily Living Scale which describes how to determine care needs for seniors. However, anyone can use the list below of daily activities to help establish in-home care service needs. Using a phone: The ability to make use of the telephone is an important function for older adults to remain connected to others and call for help if there’s an emergency. If the senior can use a telephone, look up phone numbers, and dial a couple of well-known numbers, it’s a good sign that he or she can connect with family and friends on the phone and call for assistance in an emergency. However, if a senior can only answer the phone, but not dial, or cannot use a phone at all, this indicates that he or she will need help when using the phone to connect with others or call for help. Not being able to recall how to use a telephone can also indicate cognitive decline that will likely show up in a senior being unable to complete other basic tasks. Shopping: Depending on mobility, some seniors could be able to shop for themselves if transportation is available, while others may need to have someone to walk with them through the store. More frail seniors might need someone else to do their shopping and deliver it to them at home. 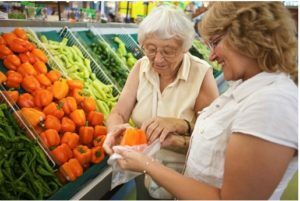 Food preparation: Appropriate nutrition is important for seniors, and you may find that your loved ones are not receiving the nutrients they need from the daily meals they prepare for themselves, or that they really are not preparing meals at all. If this is the case, they might benefit from help with food preparation. Inspect the refrigerator and the pantry shelves to note whether food is being taken out and prepared, or if it is sitting in the same location for long periods of time. Housekeeping: Day-to-day household chores can be daunting for frail seniors, who have a difficult time lifting, bending, and moving around. This is an area where many home care clients have a need to help maintain their homes. Medication responsibilities: A certain amount of memory loss is common with aging, so many seniors can benefit from medication reminders. For seniors with Alzheimer’s disease or dementia, this assistance is particularly essential. Older adults and their loved ones will probably find that, as they age, the need for assistance in many areas of daily living will increase. At Hired Hands Homecare, we provide personal care services like bathing and grooming as well as housework and errands for every client who requests them. Contact us today at (866) 940-4343 for more information about our Marin, CA home care services.